The French dimension of Newfoundland's history is accentuated by the presence, 20 kilometres off the Burin Peninsula, of the French islands of St. Pierre and Miquelon. An important fishing base for centuries, the islands' population, and fishermen from France, have had a long and varied relationship with their neighbours in Newfoundland. The islands are bare and rocky, with only a thin layer of peat to soften the hard landscape. The coasts are generally steep, and there is only one good harbour in the port of St. Pierre, where most of the inhabitants live - about 5,600 people out of a total population in 1990 of about 6,392. Adding to its importance, the town of St. Pierre is also the administrative centre and the site of the principal airport. The harbour, which originally could not handle vessels of more than modest tonnage, has been improved with artificial breakwaters. Most inhabitants of St. Pierre et Miquelon live in the town of St. Pierre, the administrative centre and site of the principal airport. 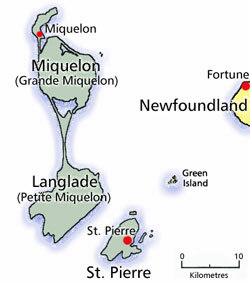 Once there were three main islands: St. Pierre; Miquelon; and Langlade. During the 18th century, Miquelon and Langlade were permanently joined by an immense sand bar and dune. Miquelon and St. Pierre are separated by a six-kilometre strait whose fierce currents inspired fishermen to name it "the Mouth of Hell." There are also several smaller islets, of which only L'Ile-aux-Marins at the mouth of the harbour of St. Pierre was inhabited, and then only from the middle of the 19th century until 1965. The population of St. Pierre and Miquelon today rely on fishing and, increasingly, on tourism for employment and income. In addition, the French government makes large expenditures on the islands, determined to maintain the last remnant of the once extensive French empire in North America.